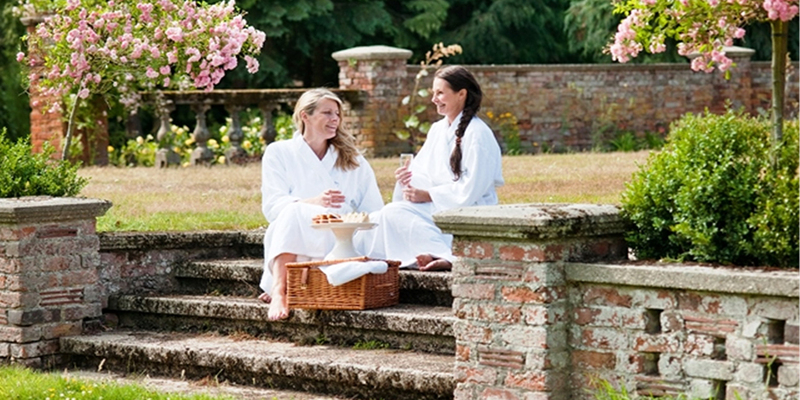 Lifehouse is a contemporary spa set in English Heritage-Listed Thorpe Hall Gardens close to the pretty Essex town of Frinton-on-Sea. The spa has a large, dramatic pool area with grey, almost industrial, pillars, and huge twisted ropes decorating the walls. 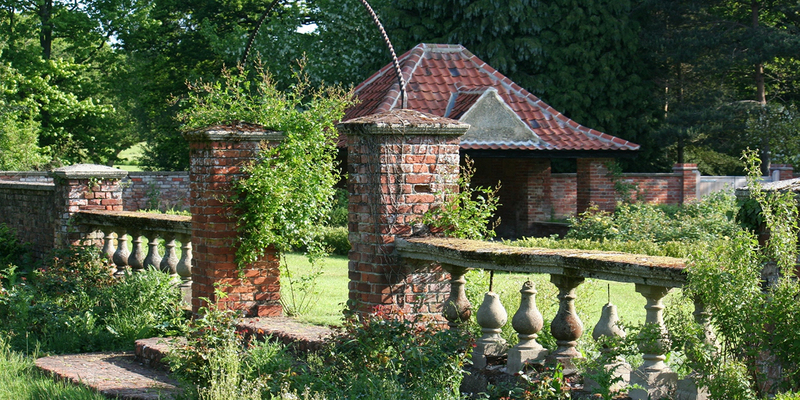 If you’re looking for cocooning quiet, try The Hidden Sanctuary for a more private experience. 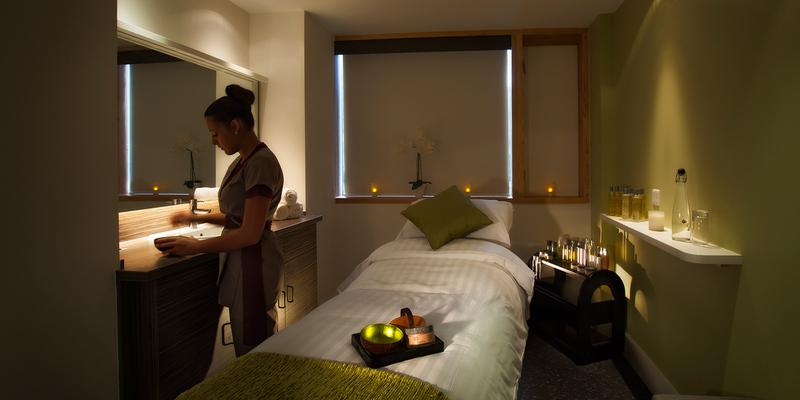 As well as traditional spa treatments, Lifehouse offers health and wellbeing consultations from resident specialists including fitness, life coaching, nutrition, weight loss and holistic therapies. 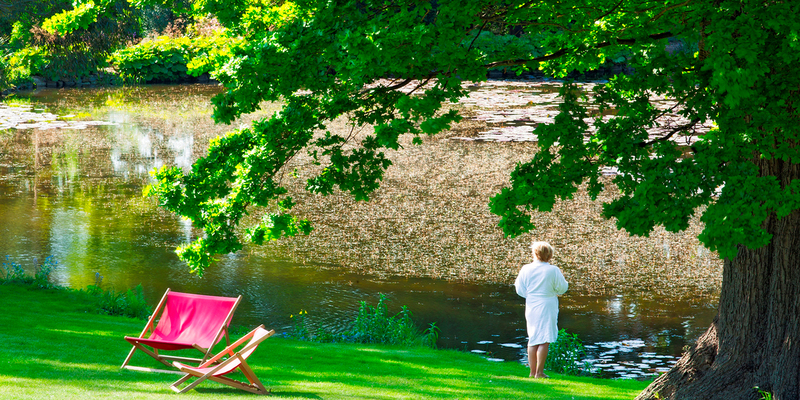 Lifehouse Hotel and Spa is set in 12 acres of listed gardens with four lakes, creating a rather "zen" feeling from the outset. 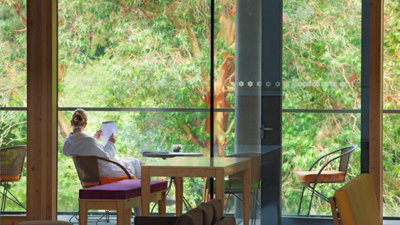 The spa uses glass sections and corridors to link the modern white square blocks with the older building and gardens. There is a good sense of bringing the outdoors in. There's a lot on offer at Lifehouse; you can choose to detox, lose weight, recover and recuperate, or just use the time as a break from the outside world. Through the glass entrance is a large reception where an open fire scents the air on cold days. Overnight guests check in here, but day guests follow a corridor to check in at spa reception. A glass walkway leads from the hotel to the spa. The reception opens out to a double-height space with a ring of windows high up in the ceiling, letting in the light. A circular reception desk sits in the middle, alongside a spa boutique, and manicure and pedicure lounges decorated with hundreds of colourful nail varnishes. A spiral staircase leads up to the mezzanine pre-treatment waiting lounge, the 34 treatment rooms and large relaxation room. The spa takes its design cues from modern Scandinavia using greys and whites along with splashes of colour in soft furnishings and stripy carpets; this makes it feel very restful. Add in the glass walls looking out over the treetops, and the outside balcony, and this is an impressively serene area. In the lounge, you can help yourself to fruit-infused water and plenty of magazines if you want to settle in for some pre-treatment chill-out time. Just along the corridor, the relaxation room has flickering candles and free-standing lamps. The walls are black and grey and there are lots of well-padded leather loungers. Snooze after a treatment or pick up a magazine and some fruit and enjoy the quiet. 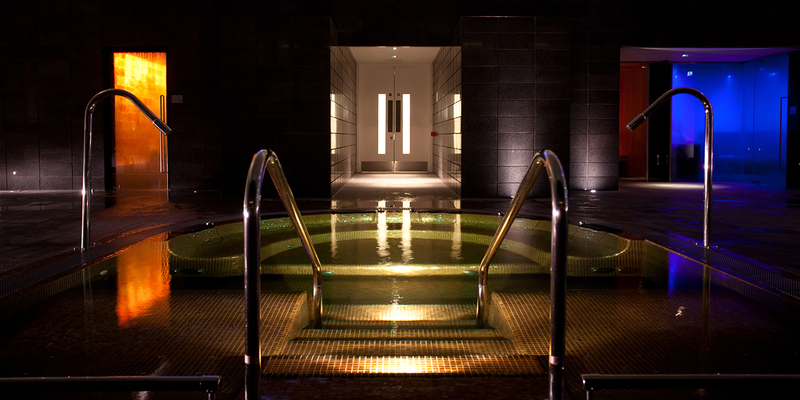 In contrast to the light and airy treatment areas, the pool and thermal facilities are dark and moody. The grey slate floor, grey-tiled walls and two industrial-size pillars are accented by full-height windows with views over greenery and trees. 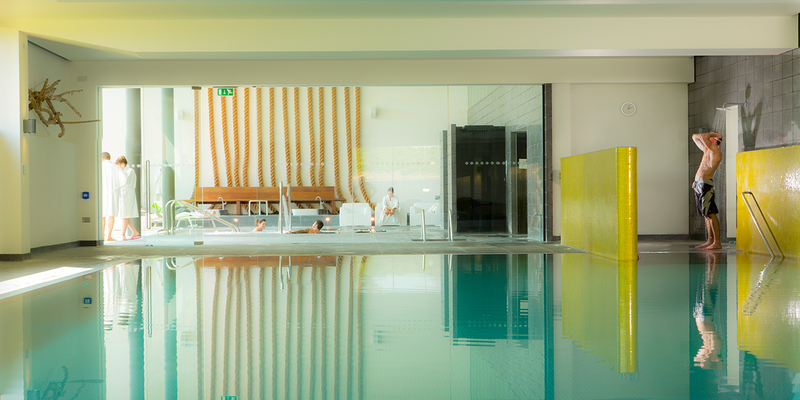 The 18.5-metre pool is free-form with a straight edge to swim lengths and a curved end perfect for drifting in. Brown loungers surround the pool. The thermal facilities are separated by a glass wall. The large hydro-pool could accommodate 10-12 people and has swan jets, airbeds and bubbly seating. The traditional wooden sauna would comfortably seat ten, as would the relatively modest steam room which has twinkling blue lights and grey-tiled seats. The salt inhalation room has an orange and white salt wall, high ceiling and beautifully scented citrus steam. When you're ready to cool down, try the chilly plunge pool and two experience showers. Driftwood and heavy ropes decorate the otherwise minimalist space. Lifehouse has very sensibly installed two changing rooms. Downstairs next to the thermal area is the changing room for day guests. Upstairs, near the gym, is a new changing room for health-club members. Both rooms have bench-style seating, private changing cubicles, showers with shampoo and conditioner, and vanity areas with hairdryers, straighteners and skincare products. Lifehouse also has a gym and a studio class with a wide selection of fitness and more holistic classes including yoga and Pilates. 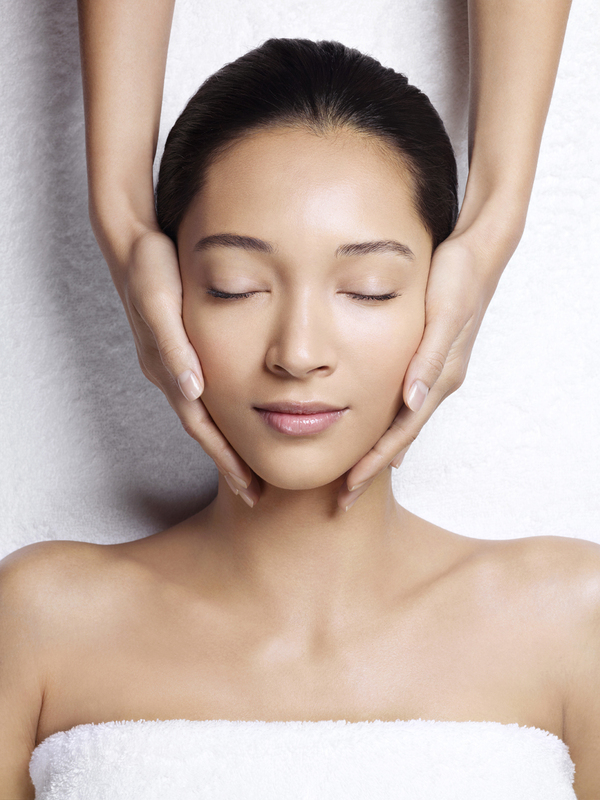 We had the Clarins Beauty Sleep treatment (85 minutes, £90). This is a full body massage with the emphasis on relaxation. Misha, my therapist, explained that it would involve a coloured light, a water pillow, and a figure-of-eight massage which represents the infinity symbol. It sounded intriguing, so I chose my light colour (pale pink) then settled my legs and feet on the warm water pillow on the treatment bed. Misha began the treatment by cleansing my feet and hands with hot cloths. While she did so, she asked me about my sleep patterns and how they affected my daily life and the state of my skin. She even asked what position I sleep in to fine-tune the massage. Misha started with the "sleep bubble"' massage, gently stroking my shoulders, neck and face. She then walked round my body putting her hands firmly on my arms then my legs. She followed that with a firm holding massage through the towels, much like a Reiki treatment. Misha used warm oil to massage my legs then my feet, paying particular attention to my puffy ankles and the arches of my feet. This was heavenly; I need Misha on standby for shopping-heavy days! She repeated the massage with warm oil on my arms and hands, paying particular attention to my wrists and palms. It's amazing just how tense working on a computer every day can make your hands. This good, firm massage loosened my hands and helped them relax. Misha massaged my neck, shoulders and face before placing a cool eye-pad over my eyes and starting a head massage. I am not a fan of head massage usually, but this was one to be enjoyed. Misha held my head very firmly and moved it around; as she did so, I felt the tension ooze out of me and into her hands. I turned over and Misha used warm oil to massage my back using that magical figure-of-eight pattern. I turned back over so that Misha could spray my face and shoulders with a cooling herbal fragrance to finish. This was a lovely, very relaxing treatment, perfect for anyone a bit wary of vigorous massage or who is feeling rather fragile. I only just made it to the relaxation room and the very nicely padded chair before dropping off to sleep. Lifehouse has an extensive, varied treatment menu with options to relax or work on your wellness. Choose from Clarins, Decléor, Carita, Natural Spa Factory, Spiezia, Thalgo, Little Butterfly treatments for mums-to-be, and treatments for men. There's a dedicated area for OPI manicures and pedicures. Lifehouse Spa also offers a range of wellness retreats, has therapists trained to treat guests with or recovering from cancer, and all staff have had dementia-awareness training. Lunch is served in The Brasserie. You can choose to sit inside or, if it's warm, out on the terrace. Robes or sportswear are the order of the day. A three-course buffet lunch with a mix of hot and cold dishes including soup and salads is on offer. I chose beef with red, green and yellow peppers which was both tender and tasty. Afternoon tea is also available if you want to celebrate. In the evening, The Brasserie serves a range of healthy foods and indulgent dishes. I was tempted by the fish or chicken on the healthy side of the menu, but finally indulged in a very tender steak and Italian fries (which turned out to be sautéed potatoes with garlic and rosemary). I resisted the chocolate dessert and opted for a very creamy panna cotta with roasted rhubarb. The menus are carefully marked to show which dishes contain foods such as dairy and eggs which some people may need to avoid. 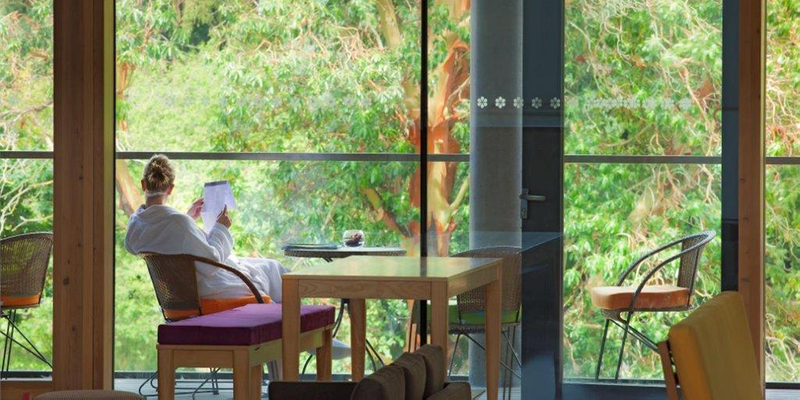 The sense of space: Lifehouse is surrounded by gardens and lakes. The glass corridors make it easy to walk between the spa and the hotel, and the sheltered terraces offer plenty of outside seating. The spa boutique: The range of products all temptingly displayed means this is a good place to stock up. The wide choice of food: There is something to suit all tastes and Lifehouse Spa takes allergies seriously. Let them know in advance and they will devise and cook meals to your dietary requirements. Parts of the thermal area look rather unloved: The "industrial" design is in sharp contrast to the very minimalist spa, and in parts it is looking worn. The spa is rather full at weekends: Book well ahead or better still choose to go midweek when it is less busy and more restful. 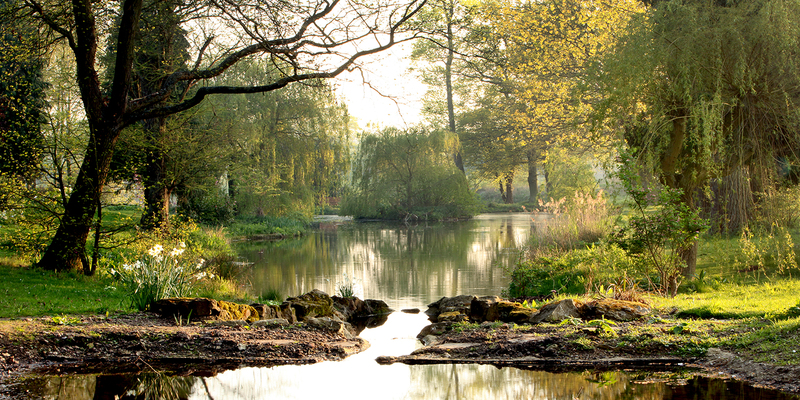 Anyone needing to decompress: Lifehouse is close enough to London for overworked city dwellers to escape for a couple of days and be busy doing nothing. Head for Frinton beach for a walk to blow away those cobwebs. Friends: The vibrant atmosphere at Lifehouse makes it a great place to catch up and there are many seating areas -- inside and out -- where you can spend time together. Anyone looking for wellness: Lifehouse offers seven retreat programmes including de-stress, detox, and recovery. We awarded Lifehouse Spa and Hotel a Good Spa Guide Bubble Rating of 5 Bubbles for its extensive treatment menu, modern design, tasty food, and friendly staff. If you fancy diving into the world of wellness, the retreats and staff training make this spa stand out from the crowd. Sybaritic Spy visited in October 2018 and awarded it 5 Bubbles. "I never write reviews but please read this first before booking. On arrival the staff were great. great check and the booking mangaer and colleague Were brilliant. Then we found a broken window in our room. it was stuck and there is no air con on a very hot day. That's fine these things happen. they was brilliant and helped us move rooms. It was a shame we switched rooms to an ever worse view and smaller bed though. The car park view was not that graet but we are not one to let this ruin our stay. We used the spa, walked the beautiful gardens and ate an 'average' dinner. It was over priced and not really up to expectational. But again we are there to relax, so I didn't compain. The this is were things got worse. Our now second room, the one with the car park view had massive red stains on the matress sheet. we pull back the cover to get into bed after a relaxing day and saw what looked like 3 massive blood patches. My fiance was in tears. It was shock and disuct. How did your cleaning staff not spot this!!! After calling reception staff member 2 was rude and said 'what do you want me to do, bring new sheets up'. - No I said switch rooms. He was angry on the phone. We packed our small bags and walked to reception. 'Staff 2' He 'death stared' us and didn't want to help at all, VERY RUDE AND AGGRESSIVE! He soon changed his tone when I asked his name, funny that. Again I never compain. Who do when the go to vist a spa and relax? I also had to suggest that we return back to our broken window room as he somehow couldn't find another spare twin bed in what looked like a half empty hotel during our stay. The next day we asked to speak to someone higher up and we spoke to a manager - She was also on edge and said she looked at the bed sheet last night and said I quote - 'it wasn't blood just rust'. What does a customer do when a manager tries to defend herself rather than helping in any way. Not ever a sorry from the manager She also said that it was clear that we used the bed. Well, how do people get into bed at night other than pulling back the covers? Yes I will share pictures. We also overheard 3 other couples complain in reception as we checked out. One other - I called the hotel to see what time I could use the pool and spa up to. They said 11pm at night. So I thought great that will give us time to arrive eat and still use the spa. But no the spa closes at 9.30pm, NOT 11pm as they said befre taking my hard earned money. On onther note - The food was also very poor. The sogy skin on overpriced fish dish. We were also seated far from the rest of the group. Breakfast was also very poor, watery mushroom and the worst hash browns you could imagine. What a shame. We go to realx for a while and we get all this and I have to spend an hour of my life complaining. No refund was offered. No free spa day. Just a small amount off my meal. And by the way I tipped the staff. These problems could have been easy fixed. And we could have left happy. We also overheard 3 other couples complain in reception as we checked out. I spoke to one guy in the car park and he mentioned how they will complain also. MAY 2016"
"I booked 2rooms for a Christmas treat for myself 2daughters and 23yr old granddaughter. We had horrendous problems. Started at reception only could find one of rooms on system had given other room to another person with same name. Not given rooms next to one another until I said Ihad requested it. No times for breakfast or directions to room. No robes or slippers in one of the room no one answering phone so back to reception to tell them. Room full of cobwebs and stains by tea tray. Reported it and told it would be cleaned that evening whilst we were out for dinner. Not done. Worse to come at breakfast my daughter had long hair attached to her beans. Her breakfast was changed using the same tray of beans. Complained to manager Mark who allowed us to stay in room until 6pm instead of 12pm ( Which still had not been cleaned ) and gave £50 refund not even 1 persons money. I paid extra to upgrade room which was a waste of money. When I emailed Mark to say I did not think after all the terrible things we should have had more compensation than £50 and longer in room. I have been many times before and things have been fine. What a disappointment for my guests especially as their Christmas present"
The Restaurant at Lifehouse offers breakfast, lunch and dinner with a Mediterranean influence, all created with local produce. The bar is open all day offering cocktails, champagne, lite bites and afternoon tea. 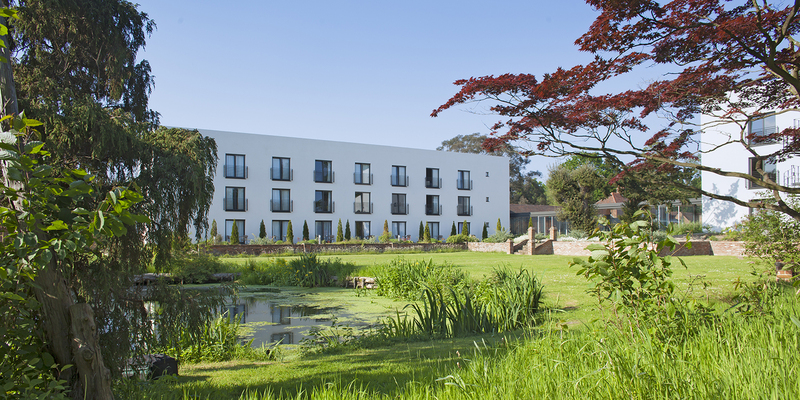 Lifehouse Hotel offers 89 en-suite rooms, featuring views of the historic gardens.